Lady Kitty is no stranger to starring in magazines, with her modelling career beginning when she was just one-year-old, back in 1992. She was appearing with her mother, Victoria Lockwood, at the time, on the cover of Harper’s Bazaar UK. She has since gone on to work as a professional model for fashion titles including Vogue Japan, Tatler, and Marie Claire – as well as walking runways for huge brands such as Dolce & Gabbana. Now 28, the royal is once again taking on the prestigious role as the subject of an interview for Harper’s Bazaar UK. And, while she may not be in the line of succession to the British throne, the model is the first cousin of Prince William and Prince Harry, as their mother, the late Princess Diana, was her aunt. Lady Kitty exuded elegance in the previously unseen snaps. Looking every inch a royal, for one capture, the fashion model wore a pale green ball gown which hugged her waist before billowing to the floor. It featured spaghetti straps and a low back. The stunning dress is by Alessandra Rich and costs £2,545 via Moda Operandi. The fashion model teamed the look with a pair of sparkling earrings. The jewels are the Diva’s Dream earrings by Bulgari, a brand which she is an ambassador for, however the price tag has not been unveiled. Lady Kitty also donned a huge Bulgari ring on her right hand. She let her blonde locks cascade in curls behind her shoulders, and had accentuated her natural features with a sweeping of matte pink lipstick. In another capture, Lady Kitty switched into a pale lilac and orange ensemble. The gown, which is no longer available at Moda Operandi, is the Attico jaquard dress. It usually costs £1,608 and has puff shoulder details, as well as two sparkling embellishments on the bodice. Lady Kitty is not the only member of the extended British Royal Family to have forged a successful modelling career. Lady Amelia Windsor, 23, who is currently 38th in line to the throne, is signed with the same modelling agency as Lady Kitty. 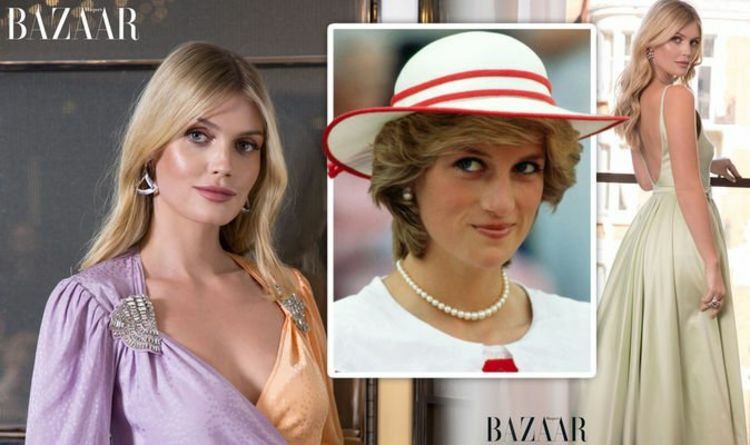 The full interview with Lady Kitty Spencer is now live on www.harpersbazaar.com/uk.